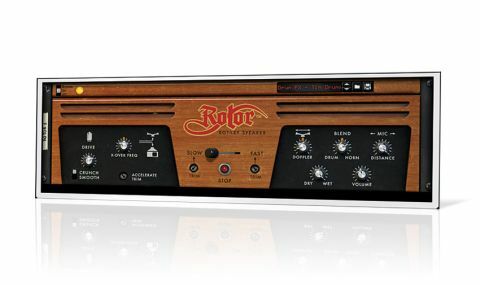 Rotor pulls off a suitably gritty Leslie emulation, delivering old-school modulation with aplomb. Propellerhead's latest Rack Extension for Reason, Rotor, is a virtual Leslie 122 rotary speaker - with bells on. The rotation speed ranges from 0.4-13.6Hz, while the inertial effects of switching from Slow to Fast are fully emulated, and the Doppler knob sets the length of the horn and drum. Crunch and Smooth overdrive options are onboard, and the crossover frequency between the bass speaker and horn can be set anywhere between 107Hz and 6kHz. CV inputs are available for a range of parameters including Horn and Drum Position (fully circular with a bipolar source), while Horn Rotation is available as a CV output for other devices. A very usable organ Combinator instrument is also included, using a 14:2 mixer as drawbars. Being by definition rather limited in scope, do try it before you buy.